Composed of a delicate blend of fragrance from Lily Of The Valley, Terrai Gingerlily Lotion for Hand & Body is a blend of surprisingly clean, voluptuous fragrance, with subtle notes that unfold like a bouquet of fresh cut flowers. It is a light moisturizer that gets readily absorbed and moisturizes beautifully, leaving the skin dewy and delicately scented. A deliciously fragrant way to feel pampered every day. It will keep your skin soft and silky smooth without making it feel greasy. 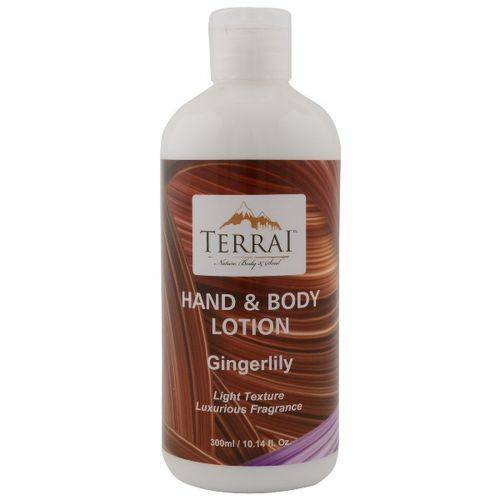 Let the Terrai Hand & Body Lotion nourish for radiant skin.